When there is so much data at your fingertips, sometimes deciphering your budget spend and how it equates to time spent by employees on a particular task can be a daunting exercise. Maybe you've got a system in place, but it's complex and not very easy to use. Maybe you're still working off a manual paper timesheet system, which is risky, costly and majorly outdated. Or perhaps you've developed some software yourself, but it's not quite up to par and doesn't offer you the control and efficiency you need. Azor's timesheet software is a little different - it offers you simple, user friendly solutions to help you monitor all of your company's internal procedures so that you can understand and improve on your specific business workflows and outputs. 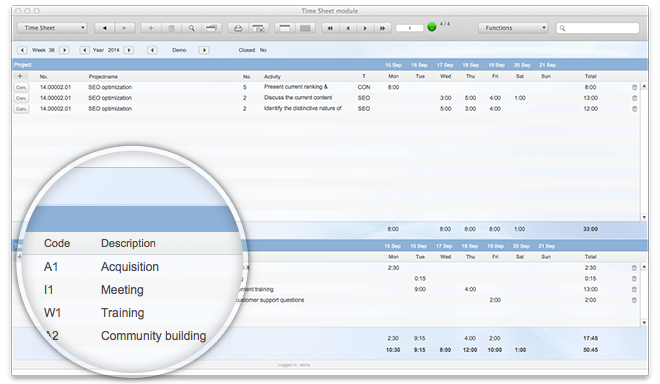 Once automated, your timesheet system can offer a level of convenience for both you and your employees. Azor's timesheet software, suitable for Mac and Windows systems, puts the accountability for hours worked, leave requests and sick days into your employees hands thus lightening the load for your timesheet administers. 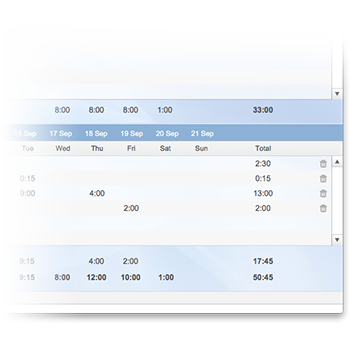 The software also enables you to track how work is dispersed by enabling you to book and view the hours worked by an employee on a weekly basis. Furthermore you'll be able to delegate as to how much time should be spent on a particular task. The better you are able to manage and maximize on valuable employee hours, the more capacity your company will have to attain more business from clients. By using Azor's timesheet software, you'll be able to add and name new clients and jobs so that you can clearly view and keep tabs on the progress of a project. This increased efficiency allows for more timeous billing procedures and a clear breakdown of services executed, thus offering your clients a higher level of billing transparency and professionalism. The best way to experience the benefits of Azor's timesheet software is to try it out. By downloading a free demo, you can navigate all the features for yourself and decide if it's something that could work for you and your business.